Go into the Talent Profile in which you wish to Publish an Archived Gallery. Click on the Galleries tab. Click into the Archived Gallery you with to Publish. 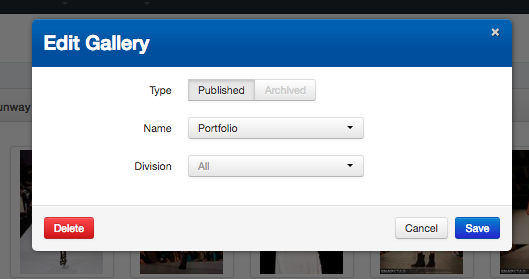 In the top right of the Gallery, click on the drop down arrow - select Edit Gallery. The Gallery will now appear under Published in Galleries. If you wish to move a Gallery from Published to Archived, follow the same steps, but when in Edit Gallery select Archived for the Gallery Type.